Polish Ḥasidic writer of the end of the eighteenth century. He is the author of "Shibḥei ha-Besht" (Praises of Israel Ba'al Shem-Ṭob), which his son Judah Löb published after his death, in 1815. The book, which is a collection of the legends current in Ḥasidic circles anent the founder of Ḥasidism, is also of great historical value. Baer, being a son-in-law of the Alexander who was for several years a secretary of Besht, received from his father-in-law valuable information on the origin of Ḥasidism, and on the founder of the sect; hence his book is almost the only source of authentic information on those subjects. 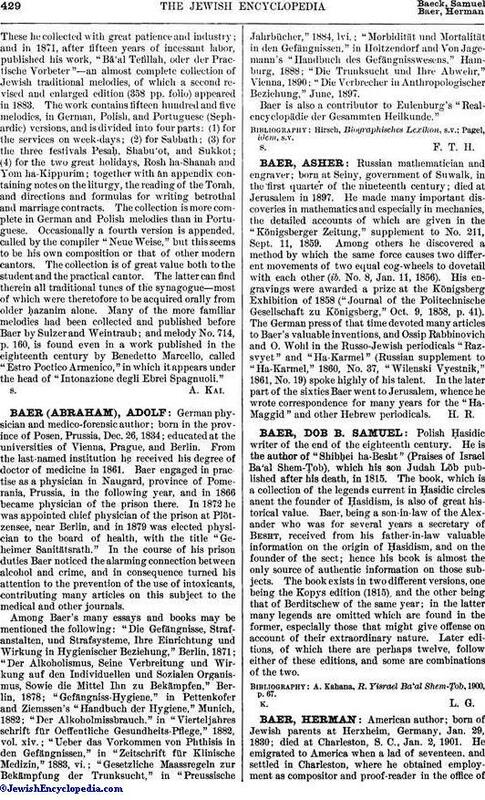 The book exists in two different versions, one being the Kopys edition (1815), and the other being that of Berditschew of the same year; in the latter many legends are omitted which are found in the former, especially those that might give offense on account of their extraordinary nature. Later editions, of which there are perhaps twelve, follow either of these editions, and some are combinations of the two. A. Kahana, R. Yisrael Ba'al Shem-Ṭob, 1900, p. 67.